Everyday, 2D software applications are still the reality for most users, whether on HoloLens or a traditional display. When you think “Microsoft HoloLens,” you probably think of CGI robots bursting through walls and animated squirrels running around. 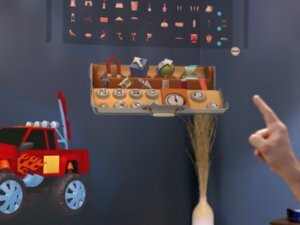 But Microsoft’s latest update to Windows Holographic reminds you that so-called 'flat' or '2D' apps—in other words, the traditional apps we already use—will be a critical part of the platform, too. 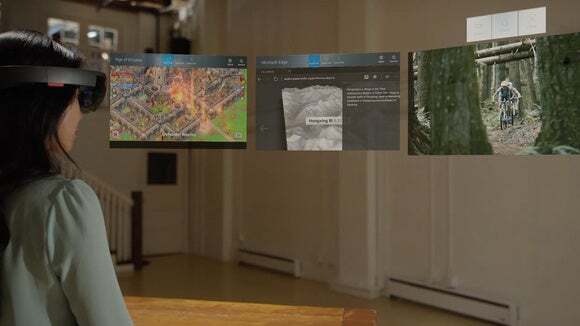 Microsoft’s Windows Holographic May 2016 Update includes support for three flat apps that can be pinned next to each other, much like you can place three apps across multiple monitors in the real world. The release notes also detail improvements to the voice controls and the Cortana interface. When I used the HoloLens developer edition a few months ago, I quickly discovered that apps like HoloTour for mapping place one giant view in front of your eyeballs, which gives an ordinary, 2D visual experience an immersive feel. But they dominate your perspective, which makes them less useful when switching from app to app. 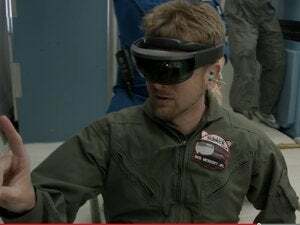 Why this matters: Browsing a virtual Web site with Microsoft Edge isn’t the thing that’s going to sell a HoloLens, especially when you discover that the resolution isn’t quite as detailed as it is on the monitor or phone you’re sitting in front of right now. But recall that Microsoft’s demos have included pinning weather apps to various objects, or sitting down and watching the game on a “big-screen” display. So-called “2D apps” are still the way we interact with the world. It all comes together in products that combine the real world with augmented screens, like the 8ninths HoloLens desk. Microsoft also smoothed out some kinks in the multimedia experience. If you're watching video, HoloLens will automatically hide the “holobar” nav bar and cursor, so as not to distract you. If you store video within the Photos app, it will stream it, rather than requiring that video to be downloaded first. Microsoft’s Groove Music app has also been added, for background music playing. HoloLens holograms can now be rotated by using Cortana voice commands. Moving an app by saying “Hey Cortana, move [App Name] here." 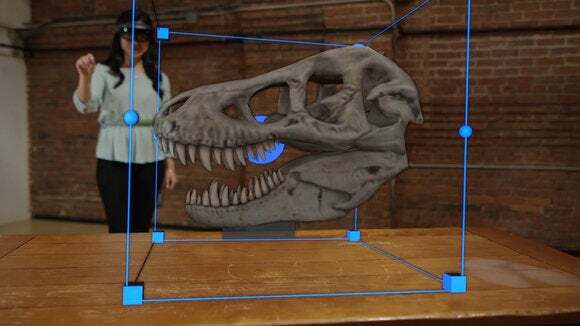 Microsoft said it will provide the new version of Windows 10 Holographic in much the same way you receive Windows 10 updates: through the updates section of the Settings. 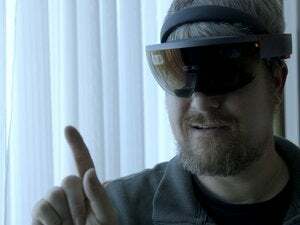 Currently, HoloLens is available to developers only; the company hasn’t released a formal timetable for when it will release a version for consumers.